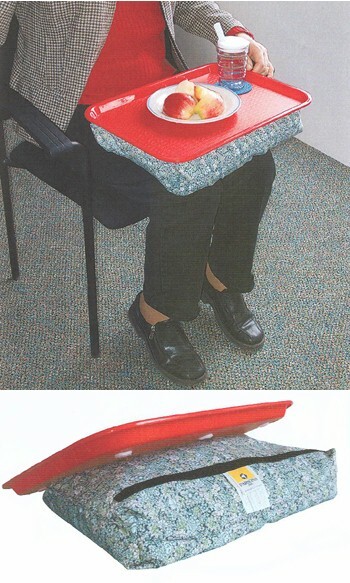 Just like the Bean Bag Dinner Tray, this nifty dinner tray also has a removal bean bag base. The difference is the 1/4 inch molding surrounding the tray's edge. This molding stops cups, plates, eating utensils and other items from slipping off the hard plastic surface. The tray has a hard plastic, easy to clean surface that easily separates from the bean bag. The bag is lightweight and filled with polyurethane beads that are form-fitting and comfortable. 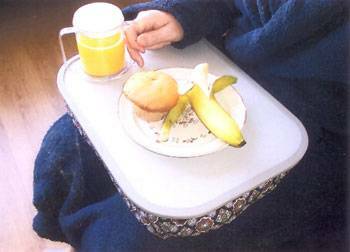 The Plastic Top Bean Bag Dinner Tray is perfect for people who enjoy eating while watching television or enjoy having breakfast in bed. It's also great for writing letters, solving crossword puzzles and much more. Its lightweight allows you to carry it everywhere. It weights less than two pounds and measures 12" x 16."